How do I “accept” an answer? I was told my accept rate is awful, but I can't find anything to tell me how to do that? You can accept an answer by clicking the check-mark next to it. Once you've accepted it, it'll show in green. You can change your choice at any time. If you decide to accept your own answer (which is totally fine by the way), you will have to wait two days after asking the question. Otherwise, you can do it when ever you like. The answer you accept should be the one that helped you the most. 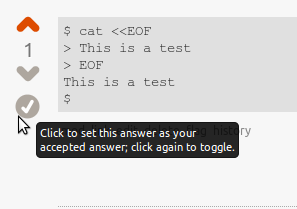 Just click the "accept answer" button next to the answer that answers your question. How to handle users that ask a question, and never come back? Is it OK to suggest to a user to increase overall accept rate?